Lately we hear all this buzz about SMART homes and SMART Bulbs & Lighting with Alexa, Google Home and Apple's HomePod leading us into the Smart home world. Once you have these devices set up they can order your shopping, manage your dairy and even turn your lights on! Smart Lighting and Smart speakers normally go hand in hand. People normally dip their toe in the smart home world with the speaker first. Most smart light blubs and systems are compatible with the leading brands such as Amazon Alexa and Google Home. The Lighting is SMART as you are no longer restricted to just being able to turn them on and off at the wall, now you can change the colour, control your lighting from your phone or even by voice control. Most Smart lighting requires a home hub allowing you to connect and control your devices via your tablet, phone or smart speaker like Alexa. We would recommend using bulbs that use WIFI to connect your Smartphone rather than just Bluetooth. When you connect via Bluetooth you have to be close by to control the light but with WIFI as long as your smart phone and bulb are both connected to WIFI you can control it from a different country for example. · Use your phone to control timing, brightness, dimming and more remotely. 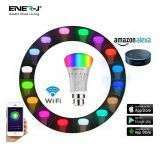 · Control each bulb individually or collectively with Wi-Fi, 3G or 4G. · Switch between a huge range of colours. · Wireless range of 100 metres. · Takes just 60 seconds to install (after downloading the app).